The Historic Chinatown Gate is a modern Paifang archway in the Chinatown-International District neighborhood of Seattle, Washington. The 45-foot-tall (14 m) archway is located over South King Street east of 5th Avenue South and the International District/Chinatown light rail station, marking the west end of the Chinatown neighborhood. The gate, designed by Paul Wu and Ming Zhang of MulvannyG2 Architecture of Bellevue, Washington, was built over a period of several months in late 2007 and is composed of a steel structure and ceramic ornaments, including 8,000 ceramic tiles made in southern China. The $500,000 construction cost was paid for by the Historic Chinatown Gate Foundation, a non-profit organization established in 1999 to build the archway. The Historic Chinatown Gate was dedicated on February 9, 2008 during a ceremony attended by local officials, including Seattle mayor Greg Nickels and Governor Christine Gregoire. Plans for a second gate at the eastern end of the district, to be located on South King Street at either 8th Avenue South or at 12th Avenue South in Little Saigon and estimated to cost $800,000, have been on hold since 2010. 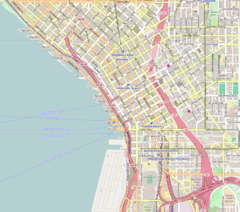 Wikimedia Commons has media related to Historic Chinatown Gate (Seattle). ^ Ng, Assunta (April 26, 2006). "Chinatown gate breaks ground on King St". Northwest Asian Weekly. Archived from the original on May 5, 2006. Retrieved November 6, 2015. ^ Lang Jones, Jeanne (November 25, 2007). "Paul Wu designs ceremonial entrance to Seattle's Chinatown neighborhood". Puget Sound Business Journal. Retrieved November 6, 2015. ^ a b Yu, Deng (February 28, 2014). "An architect whose China heritage inspires his designs". China Daily US Edition. Retrieved March 24, 2016. ^ Historic Chinatown Gate Foundation (February 9, 2008). Seattle Chinatown Gate (Plaque). Historic Chinatown Gate. ^ Lee, Eleanor (January 19, 2008). "Unveiling a beauty". Northwest Asian Weekly. Archived from the original on May 9, 2008. Retrieved November 6, 2015. ^ a b Smith, Casey (December 18, 2010). "In Seattle, plan for 2nd Chinese Gate surprises Vietnamese community". Crosscut. Retrieved November 6, 2015. ^ Long, Priscilla (February 10, 2008). "Chinatown Gate is dedicated in Seattle on February 9, 2008". HistoryLink. Retrieved November 6, 2015. ^ Siderius, Christina (December 18, 2007). "New archway to distinguish Chinese International District". The Seattle Times. Retrieved November 6, 2015. ^ Wong, Brad (January 6, 2008). "Historic gate provides another link to Chinatown's roots". Seattle Post-Intelligencer. Retrieved November 6, 2015. ^ Saito, Marino (January 31, 2014). "Plan for second China Gate still in the works". Northwest Asian Weekly. Retrieved November 6, 2015. This page was last edited on 15 August 2018, at 07:04 (UTC).